Emily is the associate director for special events and in this role develops and applies engagement strategies across a broad spectrum of events, especially donor cultivation and stewardship events and alumni event programming. 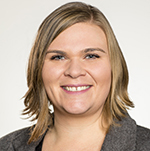 Prior to joining UW Medicine, Emily was the assistant director for Foundation Board engagement at the UW, planning strategic events and providing concierge service for the UW Foundation Board. Before that, she spent eight years at the Washington Women’s Foundation, most recently serving as the director of member and donor services. She holds a B.A. in political science from Gonzaga University and a master’s degree in nonprofit leadership from Seattle University.